There are 116 reviews of Fracas. I couldn't possibly pull this one off, but it is so audacious I take my hat off to it. Only my hat is a simple felt beret, where Fracas would wear an 18th century bird's nest or tall ship atop her powdered wig. It is the fabulous entrance of a drag queen, all air kisses and gasps. If there is anything going on beneath the floral fanfare, I cannot detect it - to me this is all pink bubblegum, and what a vivid pink it is. Isabella Blow, the delightfully eccentric aristocratic fashion icon, who wore hats as an art form, wore this as her signature. After her suicide, her protegé Alexander McQueen (who went the same sad way himself) dedicated a show to her, at which he perfumed the venue with Fracas in her honour. I imagine this must have been a outrageously pink bomb blast, painting the room in lurid, laughing technicolour. A glorious tribute. This is my favorite perfume on a woman. I just love the heady gardenia notes in this, it is the closest one can get to the long lost Jungle Gardenia by Tuvache. I am not ashamed to admit that I dab this one on every now and again. I'm surprised reading reviews describing this as if it's a soliflore. I get more peach with a soapy, woody, musky base than white flowers. It's challenging, whereas I've been finding other Robert Piguet fragrances invitingly approachable. It's dissonant in a way that works, I think; edgy, but not too much. A nice change of pace, smelling strong and interesting ahead of smelling nice. It's distinctive, smelling nothing to me like a couple mentioned below, Carnal Flower and Tubereuse Criminelle, which I do smell as soliflores. This is complex-smelling with lots of notes. The flowers are more sour than sweet to me, making it smell like an astringent soap, and a strong-smelling one. It says a lot about Fracas that there are now a couple of other serious contenders for the title of Greatest Tuberose Perfume on Earth. Frederic Malle's Carnal Flower, created by the maestro Dominique Ropion, apparently contains more natural tuberose essence than any other perfume of its type, and bears an appropriate price tag. By Killian's Beyond Love, authored by the great Calice Becker, was declared "the greatest tuberose soliflore on earth" by none other than Luca Turin, and costs a good bit itself. I can't imagine that either of these would have existed without the Germain Cellier's original, the benchmark in Fierce Perfumery. Fracas isn't as insane-smelling as some people might have you believe. Yes, it's primarily tuberose, but it's focused, with citrus (bergamot and mandarin) and greens--a combination of unnamed "green notes" on the top and lily-of-the-valley in the heart. And Fracas has a directness and a freshness that doesn't quit. 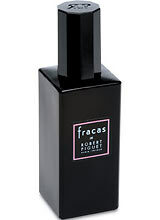 Both Carnal Flower and Beyond Love have their tuberose smoothed by coconut, which is fabulous--but they're tropical, and at the end of the day, Fracas is almost tips over into greenness. Something about Fracas puts the Fear in people. I wonder if this, like Poison, is one of those perfumes that people don't know how to wear. (It's definitely a walk-into-the-spritzed-cloud kind of a scent). Or maybe it's a chemistry thing. On me, it's a glorious, creamy, silky floral. But it doesn't run the men off. I promise. So if you ask me, this is the greatest tuberose perfume ever. It costs about a third of the competition (if you look around a little) and it hits on all four cylinders. I agree that the competitors are excellent, but this is the queen. Everything else has been--to my nose--fashioned in its image. Incidentally, I'm all for playing against stereotypes in fashion. I don't think anyone has to dress for their body type, or wear their hair a certain way, or otherwise follow the dictates of convention. I'm sure there are plenty of blondes on whom the great brunette perfumes (like Chanel Coco and YSL Opium) smell terrific. But are there people who have no personality who can wear Fracas? you love it or hate it! no middle ground,it is a take no prisoners fragrance. i love it. its my signature scent. so you will just have to deal. ha! Huge tuberose explosion indeed, that never settles..For me is too overwhelming, too much. For the respect of the legend I tried long enough to like it just for a neutral opinion, but oh no..! This is the kind that makes me wonder how come that other would like this :masterpiece"
My wife was very impresed at the first sniff of this tuberose, flowers scent.. She wears daily EDEN..
NEW: Robert Piguet - Fracas Platinum 70 Anniversary Limited Edition For Women!